With The Muppets back on network television, the time seems right for one of the best-loved members of that famed troupe to reclaim his proper place in the pop pantheon. 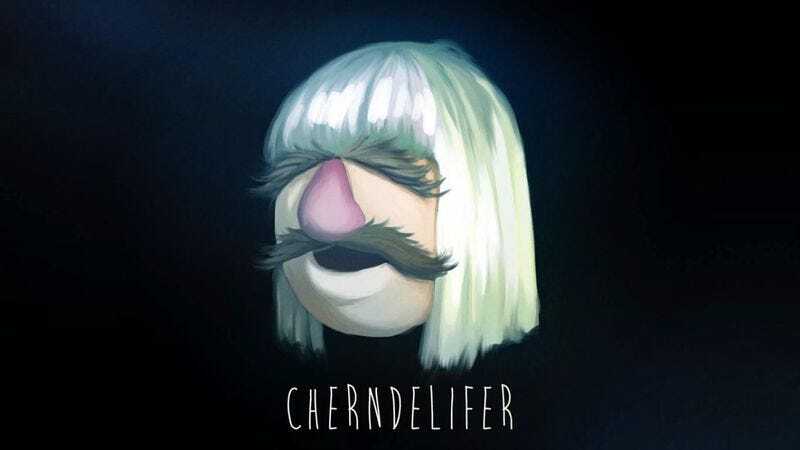 Specifically, the Swedish Chef has stepped out of his chaos-prone kitchen for a few minutes to record his own version of one of the most memorable and least intelligible pop hits of recent years, the inescapable “Chandelier” by Australian chanteuse Sia. In retrospect, Sia and and the Swedish Chef’s paths were bound to cross eventually. Both are, at their core, unknowable enigmas. Sia famously likes to hide her eyes behind oversize wigs, while the Chef hides his behind fantastically prodigious eyebrows. And both the Swedish Chef and Sia have such heavy accents and idiosyncratic diction that you can never be exactly sure what message either of them is trying to convey. This new version of “Chandelier,” appropriately renamed “Cherndelifer,” is the product of YouTube and Vine mainstay Brock Baker, a comedian and impressionist better known as McGoiter or, to fans of classic viral videos, “The Man Of 101 Voices.” In the appropriately somber-looking and blue-tinted video, Baker-as-Swedish-Chef stumbles gracelessly through the rooms of his home, occasionally making attempts at Sia-esque interpretive dance moves and becoming entangled in his window blinds. All the while, he makes Swedish meatballs out of the lyrics of “Chandelier,” reducing the song to the level of absolute gibberish, with a few “bork bork bork”s added for flavoring. And, yes, the Chef does swing from an actual chandelier for a second or two near the end. In true Muppets tradition, that does not go well for him. Meanwhile, thanks to artist Ken Sarafin, the video also features a striking rendition of the Swedish Chef dressed as Sia.